In the time before the Heresy, the Space Marine Legions brought the majority of mankind back to the rule of Terra and the Emperor. One legion stationed near the Ultra Marines home, stood firm in their resolve to bring the Imperium back to all of mankind. Their Location on the farthest reaches of the known Imperium dampened their response when the cry of Horus's treachery came. They mobilized their forces and loaded their troops and started for earth in all possible haste, then word came that unknown mechanical aliens had attacked their home world. The master of the legion debated with his advisors and finally turned most his forces back to the mostly unprotected home world, keeping faith that the emperor was well defended. 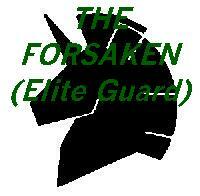 His own detachment the Elite Guard, was sent on to Terra to help in the coming battle, they never arrived. No one was prepared when the fleet exited warp space above Terra, alarms rang, people ran to battle stations. But the ancient ships had not been seen for a very long time. The markings where quickly found and sent through the large databases of the Imperial Records. Some stood shocked when the markings identified the ships as a long since presumed dead Space Marine Legion. The legion had been presumed destroyed by a Necron raid on their home, when relief from the Ultra Marines arrived they found only a barren planet and wreckage of mass combat. Now above Terra stood almost a quarter of the legions missing forces. Radio transmissions where received and they bid the Commander of the forces to land. After the inquisition was done with their interrogation, they had found that the force known only as the Elite Guard of the missing legion had been sent to earth to help in it's defense. A large warp storm had hit and they had fought against daemons creatures of the warp. Many had died and ships had been lost. Then the storm had ended and finally they had exited where they belonged, but not when they belonged. Never to look a gift in the face, the Lords of Terra ordered a immediate refit of the soon to be formed chapter. As equipment and repairs arrived at the battered fleet. Lord Uriel stood before the high lords and received his new orders. Their legion had been declared dead, and in light of the destruction of their home, Lord Uriel decided that their past was exactly that, the past. Then in a ceremony their new standard was released, and Lord Uriel declared from hence forth they would be "the Forsaken" the only tie they would keep to their past was the honor name they had received from their legion commander, The Forsaken: Elite Guard was born that day. They where offered new home worlds, but Lord Uriel said that they would find their own world, till then the Forsaken would reside within the fleet that had been their home for so long now. Then receiving their first mission the fleet embarked from earth once again to fight for the Emperor..
Army Lists Here is some of the army rosters I standardly use. Batreps New and old Batreps. Planet Carrion A story I wrote awhile back. Eviscerator A new Dark Eldar unit! Check it out. Index Page Back to the Index? Email Me Comments?, Suggestions?, Complaints?, or Chat? Drop me a line anytime. Space Marine, Tyranid, are trademarks of Games Workshop Limited. Used without permission. No challenge to their status is intended. All Games Workshop related material contained in this site is Copyright © - Games Workshop. No challenge is implied or intended.